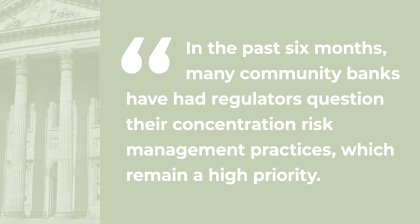 In the past six months, many community banks have had regulators question their concentration risk management practices, which remain a high priority. Examiners have informed a number of banks at the front end that the stress tests will be the primary focus, and in some cases, the only focus, of the inquiry. In several cases, regulators downgraded the bank’s CAMELS score for not having adequate stress testing in place. Regulators are less focused on the technicalities of the stress test than they are on management’s command of the tests, and how they use the results to help make real and critical decisions related to capital and strategic planning. CRE concentration risk management is not a new issue, but regulators are especially targeting banks that are newbies – those that do not have a long history of managing CRE concentrations, and are growing their CRE book at excessive rates. A BankGenome™ analysis shows that 2,004 banks have grown their CRE portfolios by more than 50 percent in the last three years, a level that has regulators concerned. As of the first quarter of 2018, 293 banks are over the 100 percent construction threshold and 420 banks are exceeding the 300 percent total CRE guidelines. 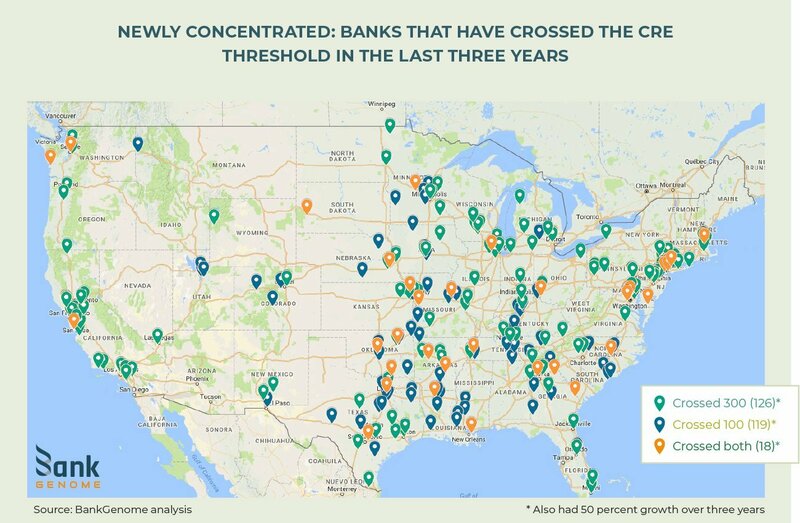 Of these banks exceeding the thresholds, 54 banks also had 50 percent or more CRE growth within the last three years — a sure sign they will face increased scrutiny under current guidance. If you are one of these banks, the worst thing you can do is underestimate your next safety and soundness exam because your last exam went well. Anticipate that the regulators will come in with ‘guns blazing’ and prepare yourself accordingly. The cold hard truth is that your bank is a prime regulatory target. It will be difficult for your examiner to report back to his or her boss that your bank is doing everything perfectly. There will be findings and perhaps even formal Matters Requiring Attention (MRAs), no matter how prepared you are for the exam. However, the key is to manage those findings. You want only minor infractions, such as not having enough loans with Debt-Service Coverage Ratios (DSCRs) in your core, or having to deal with model risk and model validation. Those are easy to address, while allowing examiners to show their boss that they extracted blood from you. You do NOT want examiner concerns to include statements such as: “Management does not understand the stress tests” or “Management does not use the stress tests”. Those type of findings are far more serious and are likely to lead to CAMELS rating downgrades or worse. Examiners expect banks with CRE concentrations to conduct portfolio stress testing, so bank management and the board can determine the correct level of capital the bank needs. The article, which appears on the Fed’s Community Banking Connections website, also notes that one new area of concern is owner-occupied CRE loans, which for years were considered extremely safe. The Government Accountability Office issued a report in March that warned of increased risk from CRE loan performance, though it was lower than the levels associated with the 2008 financial crisis. The GAO found that banks with higher CRE concentrations were subject to greater supervisory scrutiny. 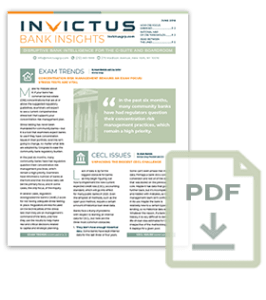 Of 41 exams at banks with CRE concentrations, examiners documented 15 CRE-related risk management weaknesses, most often involving board and management oversight, management information systems and stress testing. Prudential regulators acknowledge that proper concentration risk management is a supervisory concern for 2018. “FDIC examiners now devote additional attention during the examination process to assessing how well banks are managing the risks associated with concentrated credit exposures and concentrated funding sources,” the FDIC’s 2018 Annual Performance Plan for its supervision program stated. The Office of the Comptroller of the Currency’s 2018 Bank Supervision Operating Plan noted that examiners at mid-sized and community banks would focus on assessing concentration risk management practices. New Comptroller Joseph M. Otting testified before the Senate Banking Committee in June that mid-sized and community banks had an almost 9 percent increase in commercial real estate and other commercial loans last year. “Such growth heightens the need for strong credit risk management and effective management of concentration risk,” he warned.